DESIGN-R-LABELS (DRL) is the cornerstone for printing in-store signage & shelf labels with ultimate efficiency. Advance automation features like Intelligent Templates, Long Description Fields, Task Scheduler and many others allow retailers to create bold, eye-catching signs & labels with accuracy and ease. Totally integrated and data-driven, DRL eliminates countless human errors and saves hours of wasted time designing signs and labels and managing printers. Now, with a just a few clicks of the mouse, you can print bold eye-catching signage and labels in the office, store, and/or in the aisle. Engage shoppers by adding color. Product images, health & nutrition icons, place of origin or other product attributes are easily incorporated with DESIGN-R-LABELSand a Color Laser-Class Printer . With DRL’s Task Scheduler and the right printer configuration, you can have multiple signs & labels printed and ready for application when the morning crew arrives. We can show you how to eliminate waiting for a print job to finish before you can change stock and start the next job. With Eco-friendly two piece toners and drums and RTI’s low priced printer consumables, color printing has never been more affordable or efficient. 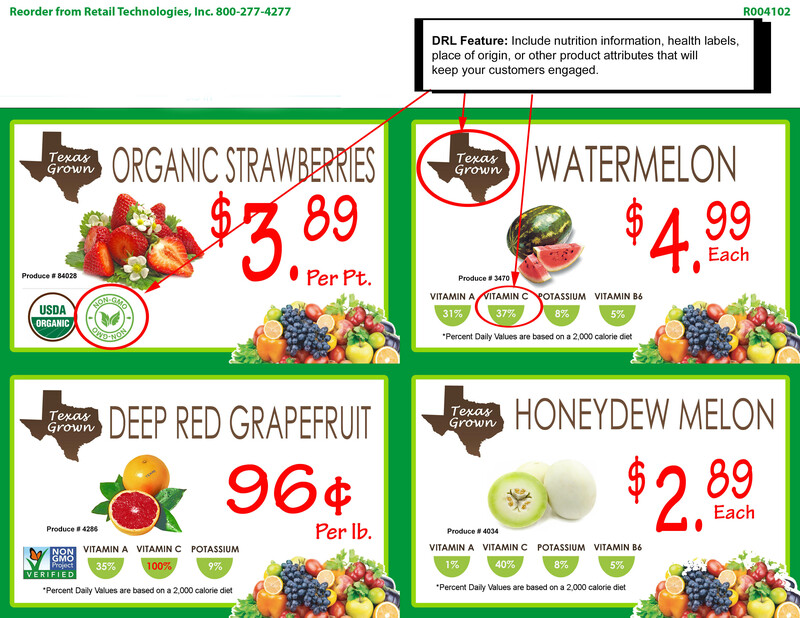 Increase profits by reducing the hours spent designing signs and labels, and managing printers with DESIGN-R-LABELS.